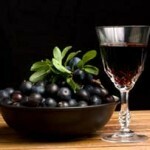 After the first frosts is the traditional time for picking your supply of sloes. The fruit is just about ripe now and late October/early November is a good time to pick if you want something to round off your Christmas dinner. Sloes are the fruit of the blackthorn (Prunus spinosa), a wild relative of the cultivated plum, and the fruits do look like small, marble-shaped Victoria plums hanging in clusters. But watch out for those vicious thorns! A walking stick is useful here for bringing branches within reach (an appropriate tool since blackthorn wood is used for walking sticks). Prick the skins of the sloes with a needle – this is tedious, but do it sitting down and with helpers. Then, for each pound of sloes add half a pound of sugar. Tip them into the bottles, up to about half-full, and top up with gin. Leave a bit of a gap at the top so that you can give the bottles a shake to mix. Store them and turn them from time to time. It should be ready to drink by Christmas, although it can be left on the sloes for another couple of months (but it begins to loose its colour after a time). Strain the sloes out. They are edible now, but very alcoholic! 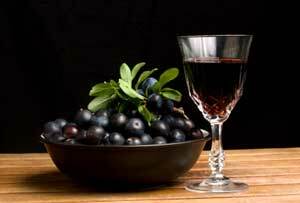 Sloe gin can be drunk as an after-dinner liqueur or mixed with white wine or champagne, or is also very good poured over vanilla ice cream. Mel: yes, I understand that when you freeze Sloes the sharp ice crystals that form in the juice within the berry puncture little holes in the skin! Hi, can you crush (gently) with a rolling pin, to disrupt the skin tissue? Hi, fourth year of bottling, great. It takes a little time but just slit the berries. Then patience, maybe ready for Christmas, we started in mid October. Has anyone an idea for the berries after their long soak. I know someon who stuffs the goose with at Christmas. Never heard of making chutney with them. They’re very, very bitter! Sorry, I don’t know how to remove the stones. I think it would be extremely arduous – it’s hard enough just pricking them. Best of luck! Let us know how it turns out! Do you have a sloe chutney recipe, or did you just think it was a good idea? I’m intrigued!